Cleaning Your Baby’s Teeth I have fluoride toothpaste and fluoridated water; do I need a fluoride treatment? When you chip a tooth badly, it can be a very nerve-wracking situation. Dr. Milan Yazdani and our team want to provide you with some information that can help if you ever suffer a chipped or broken tooth. The most common ways people break their teeth are by biting down on something hard, getting hit in the mouth, falling down, or developing cavities that weaken the tooth and allow it to be broken easily. There are a few things you can do if you find yourself in this situation, however. 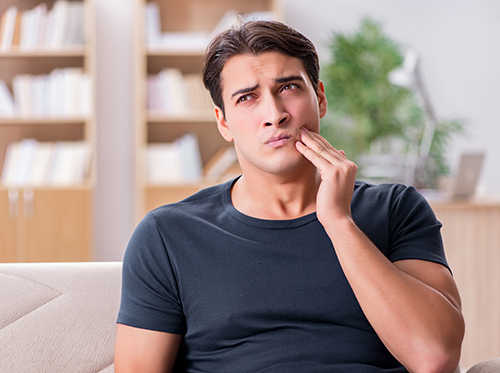 If your teeth show severe damage such as a serious break, split tooth, split root, or a decay-induced break, Dr. Milan Yazdani may need to take more time to fix the problem. If you need emergency dental care because a tooth has fallen out, call our practice immediately to schedule an appointment for that day. If you’re waiting for an emergency appointment, you can rinse your mouth with warm salt water and apply slight pressure to the area to stop the bleeding. We recommend using an ice pack to reduce swelling, but do not take any aspirin because that may increase the bleeding. If your tooth has completely fallen out of the socket, hold it by the crown and rinse it under running water. Do not let the tooth become dry; instead, place it in salt water or milk until you get to our office. Dr. Milan Yazdani will determine whether the broken tooth can be salvaged or will need to be completely replaced. We know how upsetting it can be to chip or break a tooth, which is why we want to guide you through this process. Most chipped teeth are usually just cosmetic problems, fortunately, but we know that dental emergencies can come up rather suddenly. Be sure to schedule an appointment at our Aurora office as soon as an emergency situation occurs.